Memorial Day is meant to honor the men and women who died while serving in the U.S. military throughout the history of the nation. Since some time in the 1860s, Americans had begun holding spring tributes to fallen soldiers, visiting cemeteries, and memorializing with flowers and prayers. While we all see the past a little differently, and the future with perhaps even less clarity, honoring those that gave their lives in service to the country is universal. 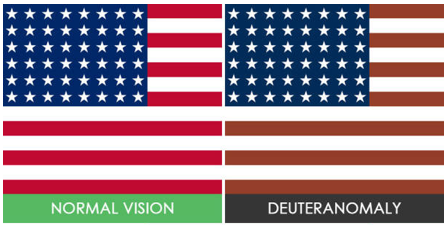 What may not be universal is what we see when we look at the flag. Very literally, we may not all see the same thing when we look at the flag this Memorial Day. Depending on certain variations in the cones of your eye, a trait passed down from our parents, some of us respond differently to the wavelengths of light that allow us to see color. 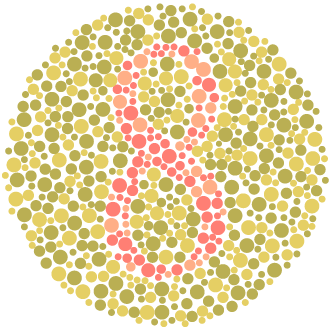 It is estimated that nearly 8 percent of males and less than 1 percent of females have color vision problems. Color blindness is not in any way a form of blindness at all, rather, a deficiency in the way we see color. Generally people with color vision deficiency have difficulty distinguishing certain colors, such as blue and yellow or red and green. Over 3.25 million people across the country are affected by some variation of color vision deficiency. Do you have difficulty telling if colors are blue and yellow, or red and green? What colors do you see when you look at the American flag? Do people sometimes tell you that the color you think you’re seeing is wrong? It could be that you may have some amount of color vision deficiency. Eye doctors generally use the Ishihara Color Vision Test to determine a person’s ability to discern different colors and shades. There are 38 Ishihara Color Vision Test plates similar to the one you see here; it’s likelyyou’ve already seen these once or twice. Besides the genetic traits handed down to us, color vision defects can also be caused by Parkinson’s disease, cataracts, aging, and a few other syndromes and side effects of certain medications. If you notice, suspect, or develop any color vision concerns, you should make an appointment to see your eye doctor who can help determine what you’re dealing with. Contrary to popular belief, it is extremely rare for any person to see only shades of gray, with no color at all. In fact, even dogs see color, not the black and white world we are sometimes told they see, they just don’t see the same range of color that humans can see. Most people with color vision deficiencies simply adapt to the world of color that they see without any real difficulties. It may mean you can’t be a fighter pilot or an electrician dealing with various colored wires, but for the most part, color deficient individuals find ways to compensate and see the world as many-hued in their own right. There are some promising signs that cutting edge gene therapies coming down the pike may help, but at present, there is no cure for color vision deficiency. There are some special eyeglass lenses that your eye doctor can show you that do help enhance color perception, and even some downloadable apps like Color Blind Pal, ColorBlind Helper, Visolve that aim to assist in various ways. Whatever colors you’re seeing waving in the wind this weekend, Berlin Optical Expressions wants to honor and salute all those that have given their lives in service, as well as each and every one serving today.